The big move is so close. We’re days away from moving into our fancy-pants, custom home. It still doesn’t seem real to me. My husband and I have had a running joke for the last year saying “It’s not real until…” and they we add whatever the next phase of construction was. And then once that phase was actually done, we’d change it to, “Well, it’s not really real until…” and the game would go on forever. However, I’d like to think the game ends when we pull up in the moving truck, which is supposed to be next week! On top of the stress excitement of moving, we decided to add a smidge more to our plates and get a dog. (I introduced him on Instagram earlier this week) I know, genius, really. Long story of how he ended up with us but the important part is he’s here and making the move with us. Meet Ceasar. Now, don’t get me wrong, he’s adorable, but he’s also a dog. A large one… in my brand-new house. And dogs come with dirt and messes and smells. They just do. 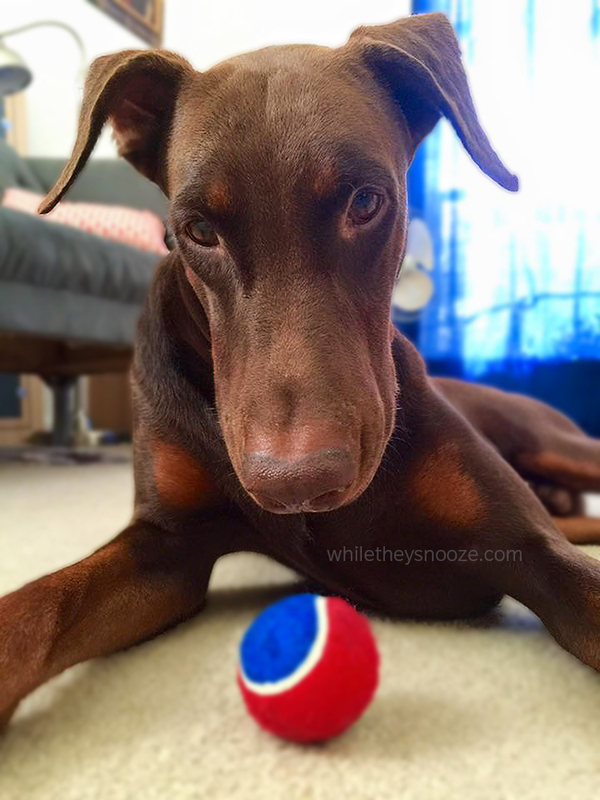 We had our last Doberman for 12 years and I know all about the small army it takes to keep a house looking and smelling fresh when you’ve got a furry beast that weighs almost as much as you roaming around (not to mention 2 kids). So, today I thought I would reveal my little budget-friendly secrets for keeping my house stylish and fresh while really living here. First, repurpose what you already have in a new way. I received this pitcher as a wedding gift. It’s hand blown glass in a gorgeous shade of blue and I love it. What you can’t see is that at some point, it developed a giant crack down the side and no longer holds water. But, it can hold washcloths in my guest bath like a boss. It’s unexpected yet functional and pretty. Little touches like that make my home a little more special and cost nothing. I also store Q-Tips in a small glass (Goodwill is a great place for odd glasses!) and, especially for bathrooms, I try to buy products with attractive packaging. I know that sounds odd but the graphic designer in me always appreciates good packaging (I do this for dish soap too!). Plus, the bathroom is one of those places where your stuff sits out­… soap, lotion, air refresher, hair products. If I’m going to look at it anyway, at least it should be attractive. 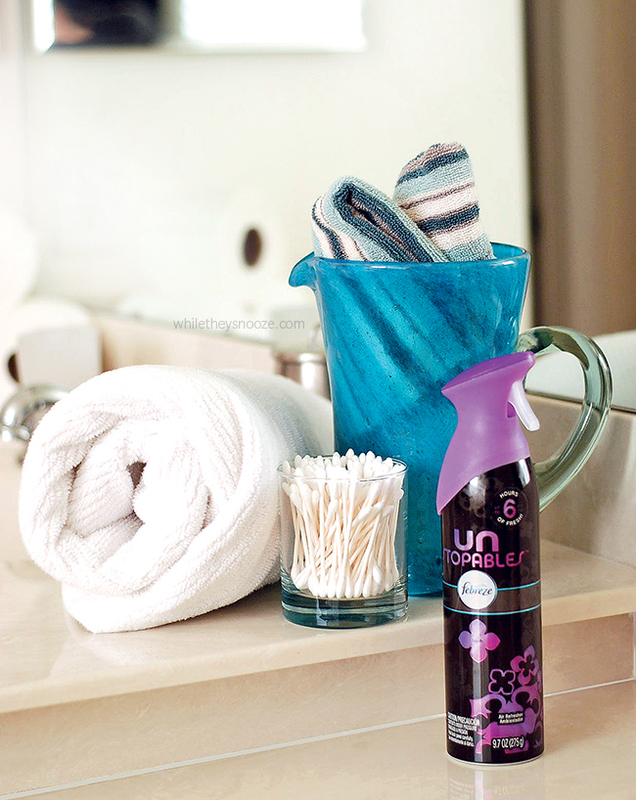 Unstopables air refresher not only makes the room smell like a boutique hotel, it looks fancy in the process. Next, I add some sparkle. A “designed” room has layers (occasionally layers of toys and shoes and laundry). 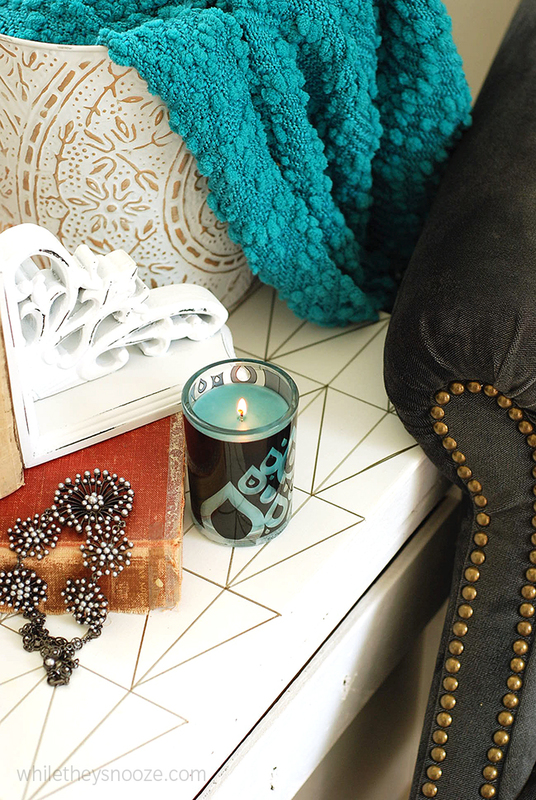 Different textures that make it feel put together and cohesive. One of the last layers to go in for me is the shiny stuff because you don’t need a lot of it and it’s so easy to add. 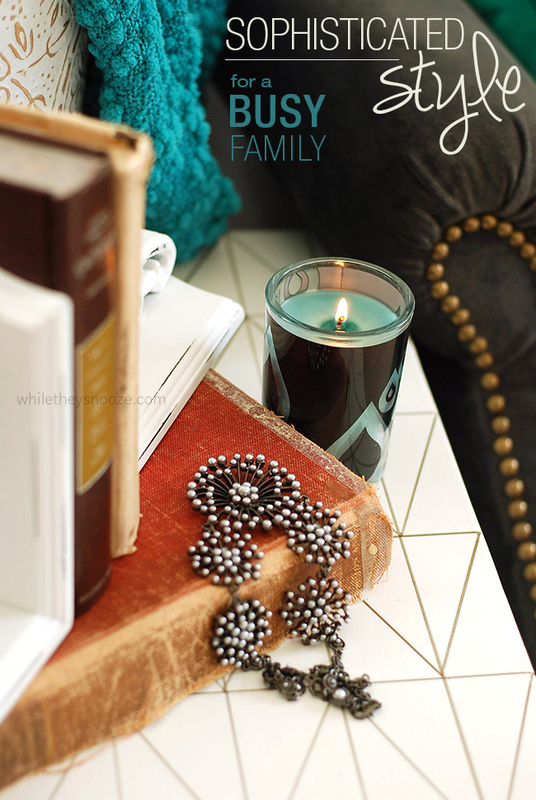 Candles add a warm sparkle and make your home smell luxe at the same time without costing a lot. This is one of the Unstopables candles in “Fresh” scent you can pick up at the grocery store. It smells like the freshest load of laundry ever and fills the entire room. Dog? What dog? J Plus, bonus tip, I know if you have toddlers, a lot of times candles are out of the question (they were for me anyway). This one had my room smelling great even before I lit it. 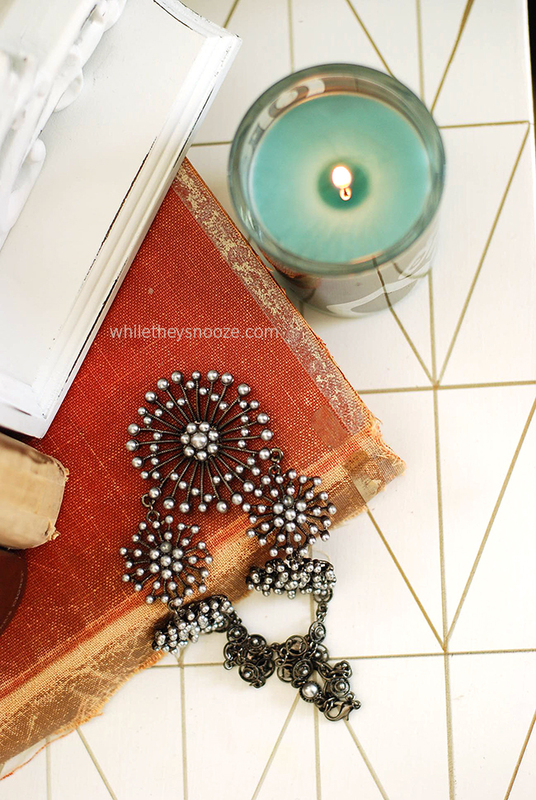 Another trick I use to add some shine is to decorate with old jewelry. The cheap dollar table at antique and flea markets are my favorite. Even if it’s broken or doesn’t look quite right around my neck… it might look fabulous in a bowl on my bookcase or hung as part of a gallery wall. And you can always DIY sparkle. Metallic markers, gold paint, and nail head trim (or even thumb tacks!) are easy ways I’ve used in past projects to add some shine to my space. Last but not least, bring the outdoors in. Branches from the yard, pinecones in winter, or cheap grocery store flowers all work to make your home feel a little more sophisticated. This is kind of a combo tip. I stuck the flowers in a thrift store teapot I got for a dollar (repurpose! 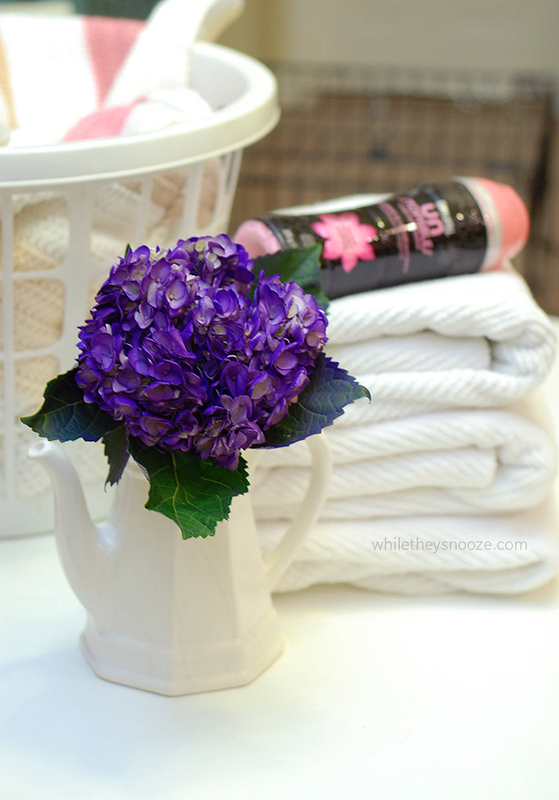 ), they add a bit of life to even my laundry room, and they smell great! Combined with Unstopables In-Wash Scent Booster, my laundry room smells even better now than it did before it was home to a giant dog crate. So wish me luck! To say I’m a little anxious about bringing a fairly new dog into a brand-new house would be an understatement. But, I’ve got my bag of tricks to keep it feeling, smelling, and looking like the dream home I’ve always imagined… dog toys, laundry, dishes and all.